Still at the height of his powers. 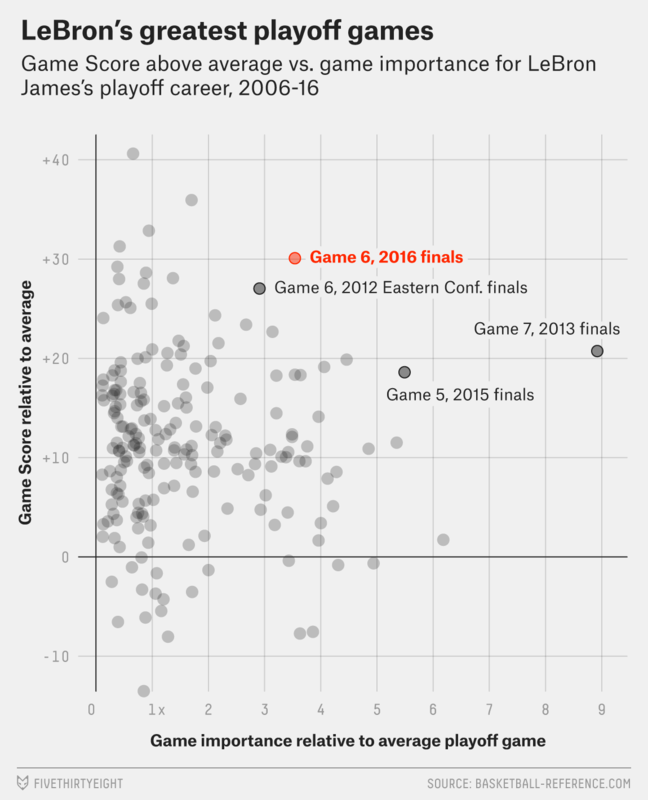 LeBron James has been so great for so long that, sometimes, it’s easy to take him for granted. This season was relatively ordinary by his standards — ho-hum, another 25, 7 and 7 campaign. There were differences from James’s earlier incarnations, such as an out-of-whack shooting stroke, but nothing so substantial as to much separate this LeBron from any LeBron of seasons past. But during these NBA playoffs, and the finals in particular, James has been playing at a level so superhuman that even the most jaded LeBron watchers have to sit up and pay attention. James’s best per-minute playoff campaign came in the Cleveland Cavaliers’ ill-fated 2009 postseason, when they flamed out against the Orlando Magic in the conference finals. His per-game averages in that series were 38.5 points, 8.3 rebounds, 8.0 assists, 1.2 steals and 1.2 blocks. But apart from that one-man exhibition in a losing effort (something James knows well), these 2016 playoffs have seen the best statistical version of LeBron — and certainly the best version ever to appear in the NBA Finals. Game Score has been adjusted to a pace of 100 possessions per game. In Thursday night’s Game 6, James produced the top Game Score of his finals career (44.1 after adjusting for pace), thanks to a jaw-dropping stat line: 41 points on 59 percent shooting, 11 assists, 8 rebounds and 4 steals. He even splashed home three of six threes, bringing his finals 3-point percentage to 40 percent, a massive difference from the 31 percent rate we were all so worried about during the regular season. The only run of performances that surpassed it came in the closing three games of the 2013 finals. That year, James averaged a 26.7 Game Score over games 4 through 6 of the series — remember the headband-losing moment in Game 6 that seemed to activate his powers? — before dropping the very best game of his career (after adjusting for the stakes) in Game 7: 37 points on 52 percent shooting, to go with 12 rebounds, 4 assists and 2 steals. The magnitude of that game helped make it LeBron’s greatest, but he’s been even better (with an average game score of 35.5) in games 4 through 6 this year. And on Sunday, James will get a chance to set a new standard in another Game 7, with the championship on the line again. Check out our NBA Finals predictions.